People -- not IT -- will unleash the power of next generation of Business Intelligence. The first era of business intelligence is over. Traditional business intelligence or BI software can't keep up with the dynamic business environment professionals work in today. Instead, people will inform their own actions using analytic experiences they create and control. Is it time for BI 2.0? In the past, IT produced reports that tried to anticipate the data business managers might want to review and what specific questions they might ask. Unfortunately, someone supporting all areas of the business is not necessarily the best person to understand the questions a line of business manager head might ask. How could anyone other than the business professional be expected to intuitively understand how a marketer analyzes lead generation efforts, how a portfolio manager balances funds or how a scientist selects new drug candidates? Current BI solutions and data investments continue to fall short of enabling these domain experts to quickly and easily get their questions answered. Spotfire, Inc. (http://www.spotfire.com/bi20), today unveiled two new whitepapers on this subject - "The Speed Society and Its Enemies" and "NextGen Software or Software for the NextGen?" Both documents are available for download free of charge from the Spotfire Web site. These papers elucidate what some are calling "BI 2.0", in which users must master business data and orchestrate their responses in ever shorter periods of time. "NextGen Software or Software for the Next Gen?" explains, "the current generation of workers selectively incorporated technology into their work; the next generation (NextGen) incorporates technology into every aspect of their lives." With previous and current generations of workers reluctant to fully accept a life of full immersion in technology, BI vendors made products that were simple-to-use and limited in functionality, with standardization taking emphasis over expertise. Vendors that will survive and prosper will need to develop software that addresses the entire BI experience, rather than providing merely BI tools and functions. Interactive, visual analytic applications change the way business users experience data and information, facilitating team collaboration across time zones, industries, languages - all in a matter of seconds. In a world where companies are increasingly equal in efficiencies, the key to differentiation will be speed. "The Speed Society and its Enemies" argues that mainstream BI tools are the enemies of speed and efficiency, because they "still operate with a reporting mentality and are driven by data warehousing technology and approach…They are enemies of speed because they lack…[the] ability to package analytical work and distribute it, not as reports, but as interactive applications that allow the viewer to engage at the level they are comfortable with - asking and answering their own questions on demand." The paper outlines a better solution with the advent of BI 2.0. 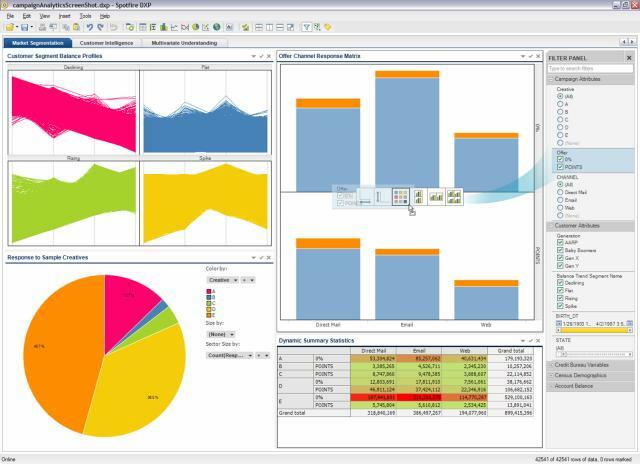 Spotfire Enterprise AnalyticsScreenshot of Spotfire Enterprise Analytics - campaign analysis solution.